To get a sense of how legal cannabis farmers are thinking about and growing their crop, I recently spent a day at the National Cannabis Industry Association's (NCIA) second annual Summit and Expo at the Colorado Convention Center in Denver. Since it was a pretty long day, I'm doing my readers a favor and breaking it up into two posts - one before lunch and one after. 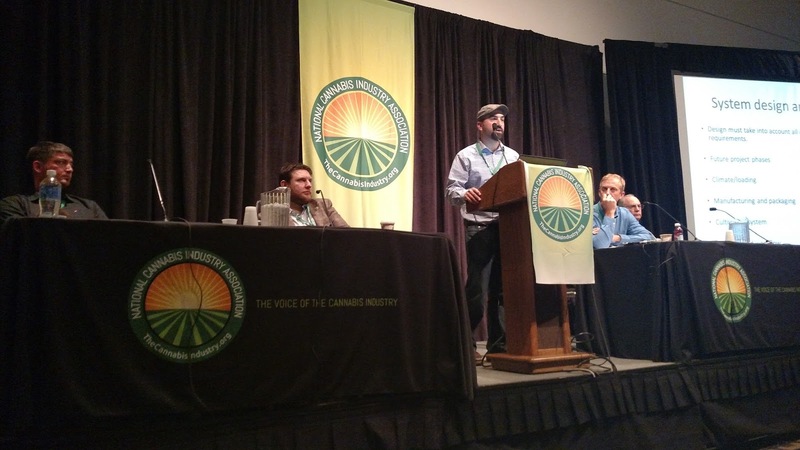 NCIA calls itself "the voice of the cannabis industry." I had heard about the expo from David Rice, cannabis farmer and founder of the Washington Sungrowers Industry Association (WSIA). Rice's organization, like similar ones in Oregon and California, seeks to unite and be the voice of growers lobbying for an environmentally sustainable industry and for regulation that treats cannabis as a crop instead of purely as a drug. Two weeks earlier, over a spotty cell phone connection from the rolling hills of Northern California, Rice told me he was part of a panel for one of the expo's workshops and invited me to attend. When I inquired about a press pass, an NCIA rep practically hurled one at me across cyberspace. On day one, June 29, I arrived at the convention center a few minutes after registration opened at 8:30 a.m. The registration line was already long. As I shuffled to the end, a woman filing in behind me asked if she was in the right line, and I confirmed. Her employer, a Nevada investment firm, sent her to scout out the industry for potential business opportunities. Based on the seventy or so people already in line - a generally well-dressed amalgam of growers, aspiring growers, lawyers, consultants, and reps from lighting, construction, and who knows how many other companies - I figured she would leave with plenty of options. The registration line for the NCIA expo on June 29, 2015 in Denver. 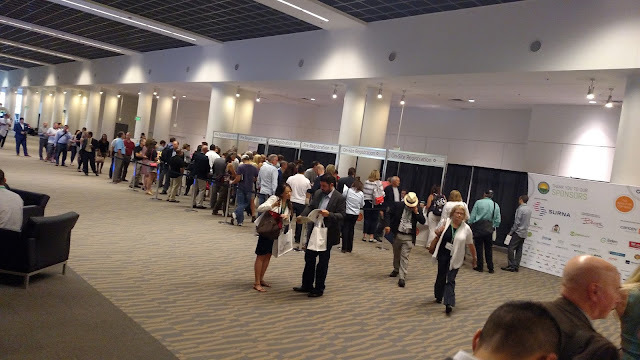 After picking up my registration materials, I was directed to the end of a second line to get my name badge electronically tethered to the sessions I'd registered for. Not being familiar with this process, I hadn't registered for any, but it turned out that the press pass allowed me to attend all of the workshops. Nice, I thought - though I already knew where I would spend my time. There were two workshops on the schedule for day one that seemed to directly address growing practices: one in the morning on greenhouse system design, and Rice and co.'s four-hour afternoon panel on directing the cannabis industry toward environmental sustainability. About eighty people attended the first workshop on greenhouse systems, filling out the eight long rows of tables and chairs that faced the panel's stage in a dimly lit conference room. They came from all over the country - Hawaii, Arizona, Michigan, and Pennsylvania were all represented - and a man sitting next to me in the front row came all the way from Australia. The title of the three-hour workshop - "Complete Cultivation System Design Process" - sounded about as thrilling as pencil lead; fortunately, the panelists had many interesting things to say and the audience didn't seem to lose interest. Panelists included three reps from a greenhouse company - the company's founder, a thermal environment specialist, and a water systems specialist - a lawyer, and a greenhouse construction consultant. Zev Ilovitz, founder of Evirotech Greenhouses, said greenhouses can be 30-50% more efficient than growing indoors. "Compliance should inform every single decision you make," advised Charles Smith, an attorney from New York who has plenty of experience with grower-clients. "This is by no means a get-rich-quick scheme. The idea that there are marijuana millionaires popping up all the time is just a farce, and has been promoted, I think irresponsibly, by the media." After a Google search turned up this, this, this, and this, it's pretty hard to argue with Smith's last point. The hype and media attention gleaned by a handful of successful cannabis entrepreneurs obscures the reality: the cannabis industry is hyper-competitive, hyper-regulated, and comes with a 40 percent chance of failure - about 10 percent higher than new businesses in other industries. If you want to build your own cannabis greenhouse, you're gonna need about $4 to $5 million. That's because unlike warehouse growing, where the grower rents or buys an existing structure on previously developed land, a modern, large-scale greenhouse operation is literally built from the ground up: growers need to find an empty piece of land with the right water and electric hookups, and then either build their own greenhouse or have one built on top of it. However, because it is more energy efficient, the greenhouse is guaranteed to be more financially sustainable than a warehouse grow, which is cheaper to start up but comes with electric bills that can soar to tens of thousands of dollars per month. The efficiency of greenhouses is going to force cannabis out of basements and warehouses, possibly for good. "As people move to greenhouses, the industry will have to move to that to compete," said Zev Ilovitz, founder of Envirotech Greenhouse Solutions and a former cannabis farmer himself. "I don't see what the future is for indoor cultivation." Greenhouses do require supplemental lighting to keep the plants on the 12-hour light cycle during the flowering phase. However, Kurt Parbst, Envirotech's thermal environment expert, said that the amount of necessary supplemental lighting depends on climate - dry, sunny climates such as Colorado's require far less lighting than say, Seattle's or Albany's. This suggests that if the industry does move to greenhouse grows, growers in some states may have a slight advantage over others. Indoor growers all have access to the same lighting technology, so this is currently not the case. Energy isn't the only area where greenhouses are superbly efficient. Eric Labatte is a Canadian water systems guru based in Ontario, an area with the highest density of vegetable greenhouses in North America. He explained in mind-numbing detail the workings of a high-tech, closed-circuit irrigation system that amounted to damn near 0 percent runoff. I thought of all the water wasted by growers who illegally divert streams in Northern California, and realized that not only is it important for growers to adopt these new systems, but it's also imperative that politicians create subsidies and other incentives to shunt the industry in that direction. If the industry keeps flourishing the way it is now, the future of the parched western American landscape may depend on it. ...and that was lunch. I'll have more from my day at the NCIA expo soon.